In anticipation of today's court hearing on eminent domain and blight, I'll point people back to this post from 11/15/06, in which the government agency responsible for finding blight curiously was unable to assign responsibility for that blight. 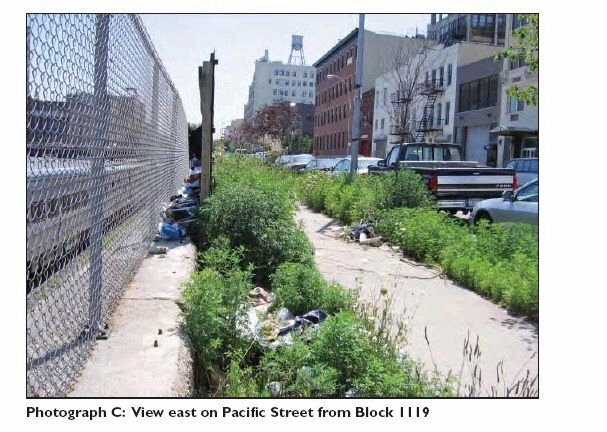 Pretty much everyone agrees that, as this photo from the Empire State Development Corporation's Blight Study shows, the Vanderbilt Yard of the Metropolitan Transportation Authority deserves better treatment. But who's responsible? Several people commented to the ESDC, saying government agencies should be blamed for neglect. The MTA didn’t keep up the visual aesthetics of its property. Otherwise the areas surrounding the Atlantic Yards are solidly middle class. The rail yards are not well lit. This is not the result of urban decay but the neglect of the MTA. The DEIS states that street lighting needs improvement. That may be true, but that is a conscious decision by the City of New York, not evidence of decay. Both the City and the MTA have failed to maintain the appearance of the rail yards and have ignored local residents when we requested such attention. That said, we would support the development of the rail yards in a plan that improves, rather than destroys, our community. The only thing you could possible see as blight are properties owned by the City, the State’s MTA, and Forest City Ratner. The only blighted area is the open space and sidewalk beside the LIRR yards.